Illustrator James Gurney, best known as the author of “Dinotopia“, and the instant art instructional classic “Color and Light” has recently released an art instructional DVD all about field sketching in watercolor. The self-published video is available from his website, either on DVD ($US 32), or by digital download ($US 14.99). James graciously sent me a copy of the DVD to review. On the disk you get an introductory chapter covering his well-chosen field kit – a set of art supplies that packs down into a tiny bag – followed by six ‘over the shoulder’ narrations, each taking a watercolor sketch from start to finish. You’ll see a few architectural subjects, some of his hallmark ‘travelling-naturalist’ studies of animals, and a ‘portrait interview’ of a civil war re-enactor. I talked to James last year, around the time of his Dinotopia Exhibiton at the Arkell Museum. Back then we discussed his philosophy to do with sketching on location, and a little bit of the “making of” process behind this DVD. Go back to that old interview if you want to see shots of the gear he’s used to make these sketches. What you are getting with these video tutorials, above all else, is the benefit of Gurney’s tremendous experience. The subjects of the sketches are not actually that important. I liked some of his locations quite a bit, others were a matter of taste. But what is of great value is seeing how he finishes these pieces. Watching step by step through his planning and blocking-in stages – crucial phases that make his remarkable finish happen ‘like magic’. If you hadn’t seen the loose, open brushwork at the beginning, you’d swear his final work was the result of painful nitpicking – rather than his free, confident sketching hand. He truly is making it look easy. But that’s worth seeing – so you know for real how to get there yourself. 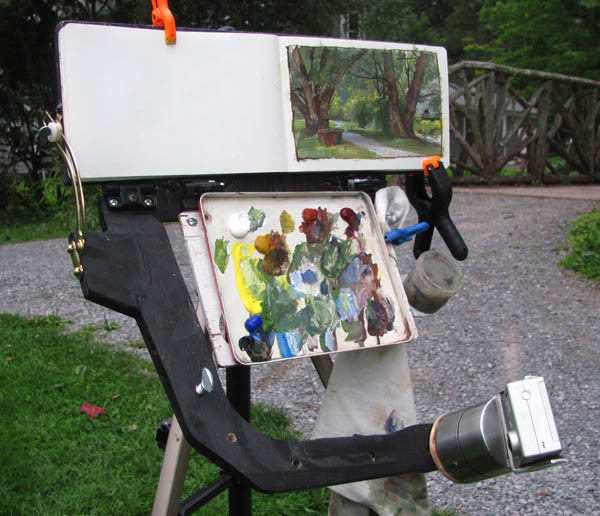 Gurney has streamlined his portable art kit to exactly what he needs and nothing more. It’s a minimum of equipment, but he wrings every ounce of performance from it. Using three kinds of material – pan watercolors, watercolor pencils, and washable (Higgins) ink, you’ll see him create a full range of values from subtle glazes to darkest darks, just as you would expect from an accomplished oil painter working in watercolor. Much like we observed at the Sargent watercolor show in Brooklyn, Gurney paints solid, massed in figures, followed up by well observed surface textures. These are on-the-money pictorial studies, quickly executed, under sometimes difficult conditions. Live animal subjects, rapidly setting sun – things one might reasonably avoid – (he says he enjoys the challenge!). I highly recommend the affordably priced download for anyone who wants to learn more about achieving realistic paintings on location. There are actually some bonus items with the download that you don’t get on the DVD. More content for less – you can’t argue with that. Thanks Marc for your review. I am new to your website – already a fan. Just received my copy of the dvd in the mail! Gurney’s videos are always a wonderful learning experience as well as a pleasure to watch. Welcome to the blog Lydia! Love his work and technique. Looks like I’ll be buying a copy! Marc, I now have the DVD and have viewed it twice and taken notes. I love it. Thanks for the review.